I've mentioned before in this very space that we became Mallards Season Ticket Holders for the first time this past season, and it has been a great experience for my family. Well, Saturday Night's victory was no exception.. Mallards come through for us again! Well…almost complete. For SOME of us, who shall remain nameless…the night isn't complete until you've mentioned seeing the goalie's MOM at Daisy Dooks, and then getting a special dance from her in your van for $3. 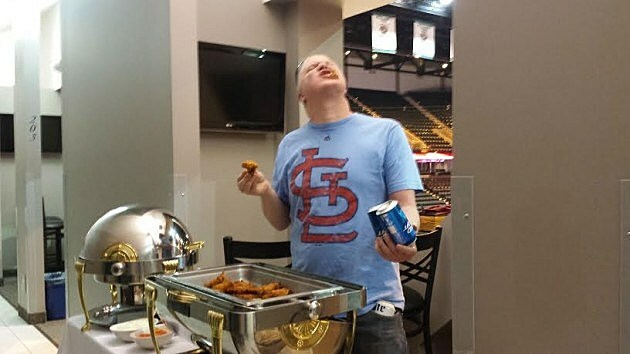 Hey, all's fair in love and goalie heckling…but as these pictures show, SOME of us took "The Suite Life" to another height…pilfering chicken wings and beer from neighboring fans…for shame!